These are lyrics by The Beatles that we think are kind of funny. It's funny because it's almost depressing. Imagine someone told you that you had to act like a pathetic loser for a movie, but then said, "wait, just act like you usually do." and he called himself a loser. Come together, right now....over me! I read somewhere that this line might have been used to describe the way Ms Rigby puts on a happy face, a smile that hides loneliness, when she goes out. I think it was a clever and beautiful (if a little unusual) way to put it. The Beatles', "Everybody's Got Something To Hide..."
Everybody's got something to hide except for me and my monkey! The most ridiculous sounding lyrics ever. A monkey? Come on! The Beatles', "Fool On The Hill"
I told you 'bout the walrus and me, man. You know that we're as close as can be, man. Yeah, but John said earlier, 'I am the 'walrus'! So does he have multiple personalities or something? The Beatles', "Happiness Is A Warm Gun"
Is he talking about Paul? because later he says "Here's another clue for you all...The walrus is Paul!" So that could be a good thing or bad thing. The longest song The Beatles ever recorded was Helter Skelter. This long yet still unreleased version is 27 minutes 11 seconds long. When you listen to the five minute released version, at the end, the song fades away, then cuts back ending with Ringo saying 'I've got blisters on my fingers', conveying his thoughts, after the 27 minute version. Just plain acid-tripping creativity. If you listen to it a lot of times then it starts to make sense. The Beatles', "I'm A Loser"
I'm a loser, I'm a loser. What, praytell, is this "Penny Lane" and why is it in his ears and eyes?? I need not say anything more. The Beatles', "Strawberry Fields Forever"
Well, he's not even in his tree, so why would someone else be? The Beatles', "While My Guitar Gently Weeps"
The song's so soft and sad and he's thinking about the housework he needs to do? George, you shoulda had John and Paul give you a hand with the lyrics. Noticed that all by yourself, eh George? Smart guy, who can just look down and see something like that. The Beatles', "Why Don't We Do It In The Road?" It seems to indicate that they wanna do something inappropriate when no one is looking. 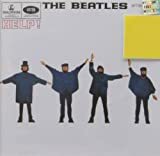 The Beatles', "With A Little Help From My Friends"
Don't we all want to say this sometimes?